The Henry Parkes Foundation sponsored annual citizenship conventions for schools between 1999 and 2007, designed to help students understand how politics affects their lives, and how they can be involved. The inaugural 1999 convention focused on whether Australia should become a republic. The 2000 convention was on the theme ‘Steps to reconciliaton’. The 2001 convention comprised a special series of events commemorating the Centenary of Federation. With the theme ‘Unity and Diversity: Living in Australia’, these included the third Henry Parkes Citizenship Convention for Primary Schools at NSW Parliament House on 27 August 2001, and the first Henry Parkes Citizenship Convention for High Schools, held in October 2001 as part of Centenary of Federation celebrations in the NSW town of Tenterfield. The 2002 convention took as its theme ‘Voting counts’. The 2003 convention focused on the theme ‘Mobilising for peace’. The 2004 convention looked at ‘Our Place in Reconciliation’, re-visiting the ‘Steps to Reconciliation’ theme of the second convention in 2000. The 2005 convention looked at ‘Our Part in Social Justice’. The 2007 convention on 19 November, focused on the theme of ‘Peace’. Also organised to celebrate Centenary of Federation year were the Margaret Parkes Federation Awards, for primary and secondary schools in NSW and the ACT.These awards are now organised annually for primary schools as the Henry Parkes Civic Action Awards. Awards were also presented in 2004 and 2005. 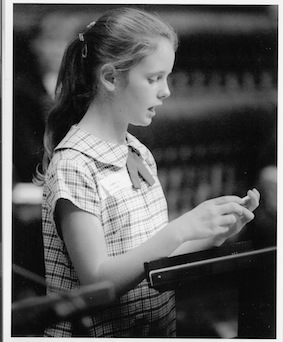 Kristina Hay, great great great grand-daughter of Sir Henry Parkes, speaks at the 1999 Primary Schools Convention, debating whether Australia should become a republic.